The main issue that I see with this deck is that it is a little too slow (unless you wish to really lean into the Heartless Summoning route, in which case you would want to bump up that up to 4 of those). 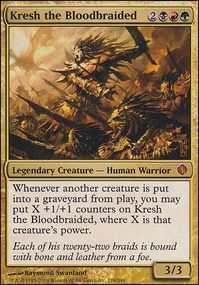 I recommend a couple of one-drops like Doomed Traveler or Hunted Witness as some good early game sacrifice fodder or blockers, cards like Viscera Seer as a sacrifice outlet, or cards like Mortician Beetle or Quest for the Gravelord as early-game threats. To fit this in, I recommend cutting down on the four mana cards, as you don't want a starting hand cluttered with too many four-drops. I recommend cutting restoration angel; it's a good effect for a lot of decks, but since you don't have many enter the battlefield effects, it's not super useful (in the same vein, I also recommend cutting Cloudshift . If you want it for the creature protection, try a couple of Selfless Spirit s instead). I'm also not completely sure about Desecration Demon ; it's a cool card and I get why you like it, but it kinda isn't related to your theme, so I'm not sure about it. I'm also not sure about your 6 and 7 mana creatures. 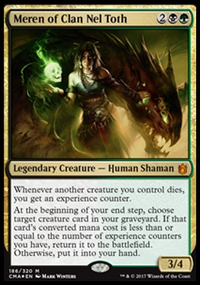 Butcher of Malakir is cool and is a personal fave of mine, but grave pact has the same ability for cheaper, and is harder to kill. 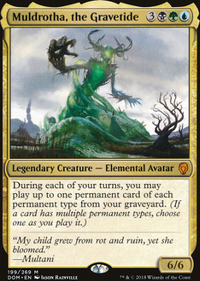 Abhorrent overlord, ascendant evicar, and sorin markov are decent, but they cost a bit too much mana for my liking. The one six mana card that I think might go well with your deck is Sun Titan , which you could probably replace Whip of Erebos with; it has a cool infinite combo where, if you have an infinite sacrifice outlet like Viscera Seer , then you can target the titan with Banisher Priest , then sacrifice the priest and use sun titan's enter the battlefield effect to bring back the priest, which can be sacrificed again for infinite death triggers, allowing you to go through your whole deck with the seer, get a very big Mortician Beetle , make the opponent sacrifice everything with grave pact, or other fun shenanigans. 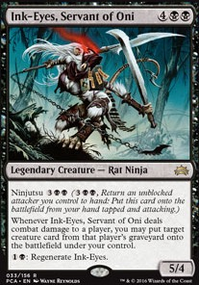 If you want other cards that could be a threat later on, I recommend X cards like Hangarback Walker or, if that costs a little bit too much money, Mikeaus, the Lunarch. I'm also not sure about the devotion subtheme; you do have some cards with a lot of black, so it might be powerful, but devotion tends to be a little iffy in two color decks, so I'm not sure about it. 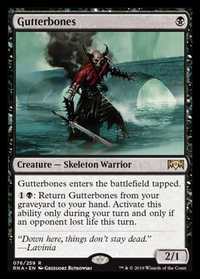 Other cool cards to consider might be Cartel Aristocrat , Bone Splinters , Plaguecrafter , or Ayli, Eternal Pilgrim . Hope that helps! Have you thought about more copies of Judith in the form of Mayhem Devil ? 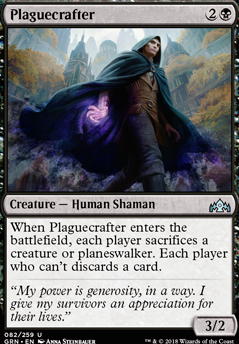 It has comparable mana cost and also isn't legendary PLUS things like Plaguecrafter ping your opponent twice if you both sacrifice.